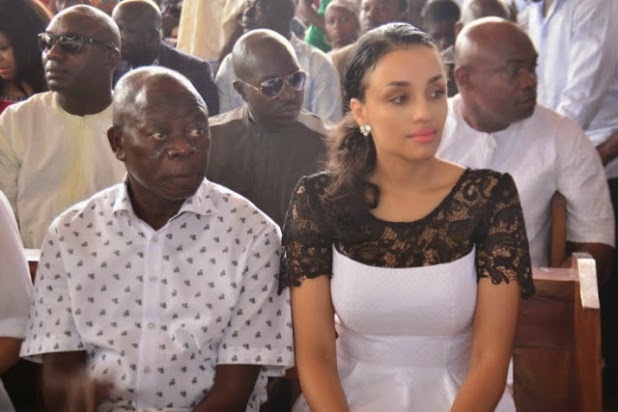 Well, since Adams Oshiomhole married a pretty lady from Cape Verde, we have been asking ourselves how many of our young beautiful ladies, these wealthy aged men have scooped away. 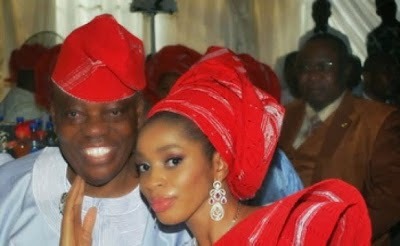 74 year old Billionaire Chairman of Eleganza Group of Companies, Aare Razak Okoya married his youngest wife Folashade Okoya when she was 25 about ten years ago.The couple who have 4 kids together officially tied the knot earlier this year in March at a lavish ceremony at his palatial home, Oluwanisola Estate in Lekki, Lagos. Lagos Governor, Fashola Raji Fashola and Asiwaju Bola Ahmed Tinubu were just a few of the dignitaries in attendance. Razak Okoya has 2 other wives, his first Alhaja Kuburat Okoya and Alhaja Ajoke Okoye. Sade is not just a pretty face, she also sits on the board of one of his companies, is a managing director at three of his Eleganza companies including Eleganza Fashion Products Limited and a few months ago she received an honourary Doctor of Science, D. Sc in Business Management and Corporate Leadership from the European American University. 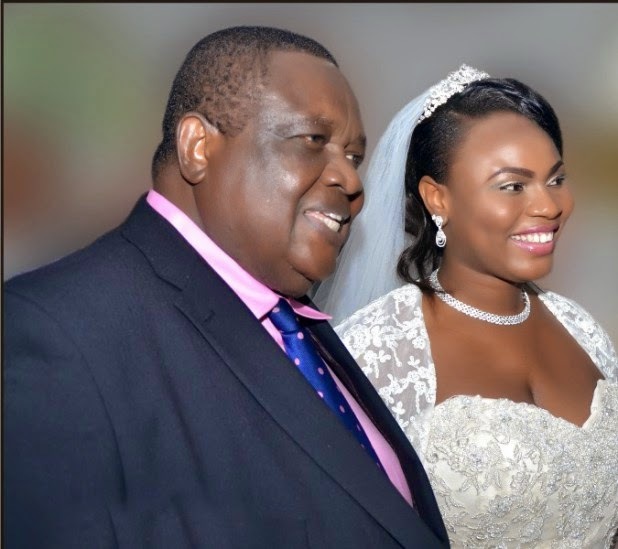 73-year-old Nigerian politician, statesman and businessman Chief Emmanuel Iwuanyanwu last year tied the knot with a woman almost 50 years younger than him, 26 year old Frances Chinonyerem Enwerem.According to reports his marriage to his 26-year-old bride did not get the blessing of his kids with his first wife. The wedding came two years after his wife of 40 years, Eudora Iwuanyanwau lost her life to cancer. The now 73 year old billionaire and his young bride now have a child together, she was reportedly prego when they married back in September last year. He has other older wives but these are ones he rolls with. The youngest of his wives recently turned a year older, she is reported to be in her mid 20s. 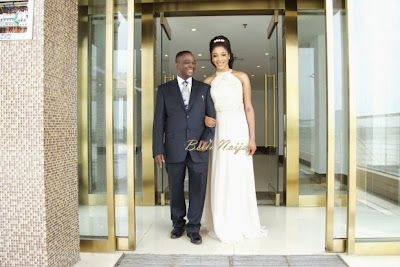 In 2004 billionaire Musa Danjuma tied the knot with one of Nollywood’s most after actresses Caroline Ekanem. He was 54 and she was 24.The actress turned her back on Nollywood, instead shifting focus to her life as a wife, mum and businesswoman. 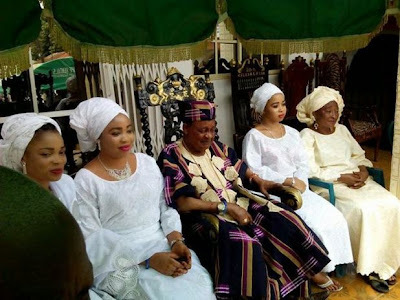 She is his third wife, Chief Emeka Offor married his first wife, Mrs. Nkiru Offor from Imo State in 1982 and his second, Mrs. Joy Offor also from Imo State in 2002 before the latest addition, Adaora, daughter of wealthy Onitsha businessman. 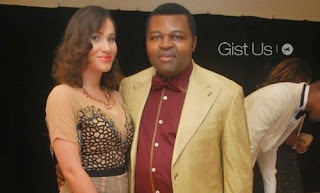 The newest couple kicked off their wedding with a quiet ceremony on October 12, 2013, before the wedding jamboree on Friday, January 3, 2014.Sir Emeka Offor will be 57 this year while his new wife, Adaora will clock 25. Sir Offor’s eldest child, Ndidi is 30 while his first son, Chike is 28. Former beauty queen Dabota Lawson married billionaire businessman Prince Sunny Aku in an elaborate ceremony on the Dec. 13th , 2014 at the Sky Terrace Hall, Oriental Hotel in Lagos. Prince Sunny Aku, the CEO of Novena Majesty Furniture, said to be in his 50s while Dabota is said to be in her mid to late 20s. When they began their relationship, the odds were stacked against them. A 22 Year Old Law Graduate and reigning beauty queen, an ex-soldier and Biafran leader in his mid 50s.